Oh man, oh man am I excited! I am bringing you The Sheet Mask Squad July box review - a recent arrival on the subscription box scene, packed with amazing sheet masks. Sheet Mask Squad is made up of 4 lovely ladies, who adore sheet masks as much as any sane, responsible person. Although they're UK based, the squad itself is scattered around the globe. This brand came together one night, while they were sheet masking and fighting over a single mask that they all wanted, and now we have a beautiful third baby (they kicked things off in May), full of goodness for your skin. I have been in contact with one of the girls, extensively researching the brand, because I've already burned myself with a previous subscription box, where it was nothing but disappointment. I am very happy to say that it is not the case with SheetMaskSquad! We also met for lunch, when I received my box - the previous box they sent disappeared in the mail (not the first time that's happened to my packages...Royal Mail - you disappoint me so...). I am honestly amazed at how much thought goes into every box - every girl chooses 10 sheet masks to test for every month, out of which they pick out the ones to be featured. The aim is to have 10-12 masks (there are 11 in the July box), 2-3 high end (think over 5$ per mask), 4 mid range (2-4$ each), and 4-5 road-shop (1-2$ each). Priced at 24,99£ for a month-to-month subscription they're not 'cheap' - but neither is their selection. The most important aspect of The Sheet Mask Squad goal is that the masks provided are picked out to give you not only variety, but great quality. It's not just popular, cheap masks thrown in randomly, so even the lower-end ones pack a punch. To start off, you are greeted by - a Thank You card that contains 10% for your next purchase, a card with all the masks listed with their main features, a business card for Sheet Mask Squad and a packet of 4 samples. The cards are of great quality, not flimsy - textured paper with the SheetMaskSquad print. Each mask contains it's main features, as well as the variations that are possible (some of the masks vary throughout the boxes, so you can check which you received). And, finally, you get to your pile of (11) sheet masks! Which, let's all admit, is always like opening a Christmas present! July's 'pick of the month' is Maskingdom Red Riding Hood Ultimate Truffle mask - there are 4 varieties (Wine, Boletus, Pearl and Chocolate), and I got the Wine kind (The Sheet Mask Squad uses pick of the month to highlight a brand, it's one of the high-end masks). I have never tried any Maskingdom sheet masks, and they are just ridiculously adorable - I am probably going to save this for last..just because it looks too nice to use...Tell me I'm not alone in this?? The one tiny thing I am a little concerned with is the eye mask - it's great to have, and certainly something that's useful for those of us who like to binge-watch TV shows (NCIS fans anyone?? ), but I know that for people with sensitive eyes it could prove disappointing...still, you have 10 masks to pick from! As I've mentioned, I've actually met with one of the girls - Ling. Meeting with Ling was absolutely lovely - it was great to meet someone who is as passionate about Korean/Asian beauty as I am. We talked for hours about our favourite products, shared stories about our sheet mask journey - there are so many masks we both like I was sure I'm going to enjoy the contents of the box. Ling also, very generously, gifted me with 5 additional masks - May's pick of the month (Whamisa fermented mask), June's pick of the month (Purpletale 5 Steps to Lovely Skin mask), two 'spoiler' masks for August (that I will actually be reviewing next week for you), and another mask from Maskingdom. Like what you see? Stay tuned to my Instagram for the reviews of the August 'spoiler' masks! Don't forget to subscribe to the SheetMaskSquad via my link, to get 10% off your first order - subscribe until the 20th of this month to get the July box! The big question is - will be I a subscriber after this?? Absolutely! 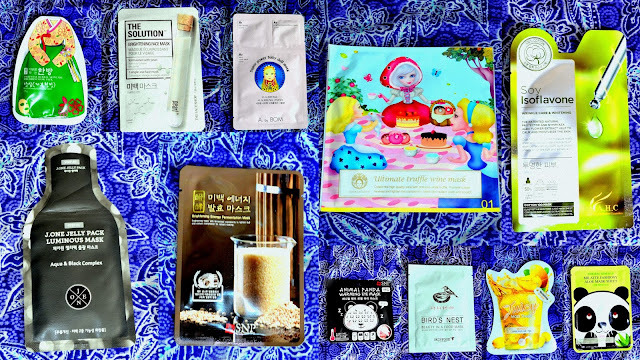 Honestly, this is by far the best Asian Beauty subscription service I've come across - you get great quality masks that have been very carefully curated, so you certainly get your money's worth. 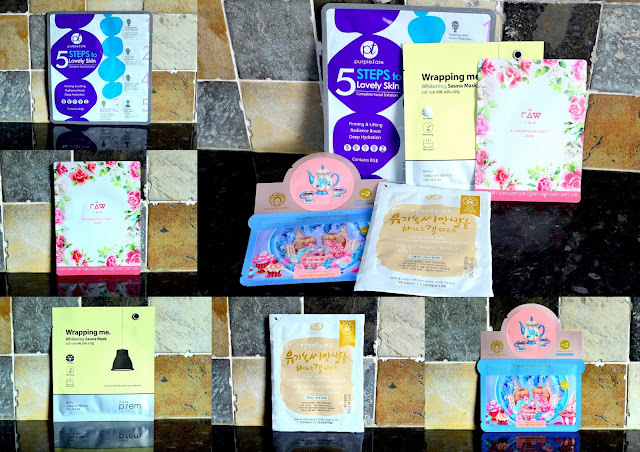 And because this is a sheet mask subscription box, you know what to expect (unlike how some beauty subscription boxes that promise you 'full size items', but really mean sheet masks). I want to stress again - although this was provided for review, my opinions are 100% honest. I want to share with you what's best, and not so great, so you can always be sure that I only write what I truly think. Which masks are you the most excited about?? Comment bellow!